To keep your fuel costs down in the winter months, you need to know how to avoid extra charges and hidden fees. The following article covers various ways to avoid extra fuel charges and still keep your home warm during the cold months. When it comes to a heating fuel tank, one of the biggest mistakes that you could make is to allow the tank to run empty before ordering a refill. You should not ever let the fuel supply run low. In an oil tank, for example, dredges inevitably get kicked up from the bottom, regardless of the oil's initial purity. Consequently, sludge is always a possibility and this could clog the tank if the oil supply runs low. Given how most oil and propane supply sources are only open at certain times, it can be dangerous to allow your tank to teeter on empty. What if your oil runs out entirely on a Saturday night during a subzero streak and the nearest supplier will not be available until Monday morning? What if your supply runs out on a holiday? Even if a refill is always just a phone call away, you might still have to wait several hours in the cold. If you let your oil or propane tank run empty before you call for a refill, the service technicians might need to restart your heating system, and this could add to the overall expense. Simply put, heating fuel is not something to regard in the same way as the battery for your remote control, the coffee in your kitchen or anything else that you can simply replace when the current supply runs out. Heating fuel should instead be likened to the gas and oil in your car, which you would never let run out entirely. Oil is currently valued at $2.00 per gallon. Oil value could fluctuate at any time, possibly to $3.00 per gallon. Purchase a capped plan and for a fee of 25 cents per gallon, the price of your oil will not exceed $2.00 per gallon, no matter how high oil values might rise. Therefore, you would pay $2.25 per gallon for the length of your contract with said company. While that would certainly be better than paying $3.00 per gallon, these types of pitches are often built around scare tactics. Hikes in oil prices rarely exceed 30%, even during the coldest months of the year. Chances are, you would simply be paying a 25-cent-per-gallon fee for protection that would not prove necessary over the course of the contract. Each time you have your tank refilled, it is wisest to purchase the amount of fuel that you will possibly need for the fill cycle at hand. Some homeowners simply make do with the minimum order size, assuming this will help them save money in the short term. However, your tank could run low before you even know it if you skimp by this way. In a worst-case scenario, a meager oil fill could leave your tank dangerously low at the worst time, such as on a weekend or holiday during subzero weather. Avoid this problem by ordering for the long term. Delivery charges: This is the price to have the oil or propane poured into your tank by an outbound delivery service. Fair enough, but the charge should always be included in the quote. Some companies will leave this out and only quote the fuel price. Fuel surcharges: These are additional charges attached to the fuel or the delivery. They are typically extraneous and not mentioned in the original quote. 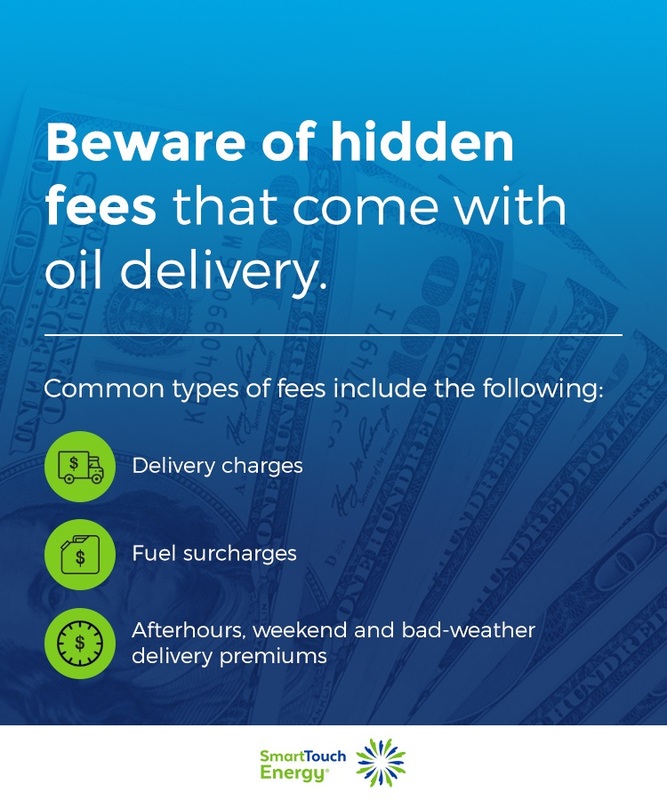 Afterhours, weekend and bad-weather delivery premiums: Some delivery services are available 24/7, 365 days a year, but you will pay a premium for delivery at odd hours or during Sundays or holidays. While these premiums are reasonable, delivery companies should be transparent about these extra fees. When you accept a deal on fuel delivery, make sure that you know and understand any applicable fees. Most importantly, the quoted price when you place an order should be the final price at the time of delivery. When it comes to purchases, buyers often gloss over the fine print. This can be a grievous error when you consider the things at stake. With oil or propane, you are dealing with the fuel that provides the heat supply in your home. If the fuel is of poor quality or the delivery goes awry, you could find yourself short-changed and potentially at risk of much worse problems. Some companies will not accept any responsibility if things fall short on their end, but you would not know this unless you read the fine print. To avoid being at the short end of the stick, consider what could possibly go wrong with a fuel delivery and make sure that you know your options. Some fuel delivery companies will try to sweet-talk you into a contract. It might look good on paper, something along the lines of "sign up for a year and save 25% on fuel delivery." However, they will usually attach a steep cancellation fee if you choose to end the contract early. In other words, you are contractually bound to a company whose service you have not even tested and the burden is on you if the company does not keep up its end of the bargain. The delivery truck is late and has to reschedule on more than one occasion. The fuel is lower grade than advertised or corrupted with impurities. The service is performed by an irresponsible set of hands and fluid is leaked outside the tank. In any one of these situations, you would probably wish to cancel the service. Even if the service meets expectations, you still might find a better deal elsewhere. Companies confident about their service do not need to lock customers into contracts. In most cases, the savings associated with contracts are minimal but the confinement is loaded with potential problems. A respectable company will simply let you pay on an order-by-order basis knowing that the quality of their service will win your repeated business. As noted earlier, fuel deliveries at odd times will typically come with extra fees attached. The reasons for this are simple — everyone needs to sleep at some point and most people wish to spend holidays with their loved ones, including fuel delivery workers. Companies that offer services at odd hours generally need to charge more for these deliveries to cover the higher wages that the staffers are paid for working these odd days and hours. Of course, you can always avoid these extra fees by simply monitoring your fuel supply. If your tank is running low, schedule a daytime delivery as soon as possible. As the holidays draw near, make sure your fuel supply is healthy for the long haul. Full tank: If the tank is full, the gauge will be high and aligned to the line marked "F."
Half-full: If the tank is half-full, the gauge will be in the middle of the cylinder, aligned to the line marked "1/2." Quarter-full: A tank filled to 25% capacity will set the gauge at the "1/4" mark. If you are heading into cold weather, a gauge that reads 1/4 or under should alert you that you will need a fuel delivery in the week ahead. For example, if the outside temperatures drop to the lower 30s, you will probably burn through roughly 6.5 gallons each day in a 2,500-sq-ft house. If the tank holds 225 gallons and is only a quarter full, the remaining 56.25 gallons of fuel will probably only last for eight more days. For any given product, prices tend to be low when demand is at its lowest. With heating oil, the season that has some of the best deals on oil is summer, simply because few homeowners are concerned with heating their homes during June, July and August. What most homeowners do is wait for October or November to roll around and then reactivate their heaters after six months of dormancy. This can be problematic on several fronts. If the tank is empty, you could find yourself paying far more for oil than you would have only four-to-six weeks earlier. If the heating system fails to work after all that time, you could be strapped with urgent repair costs. To save money and avoid sudden expenses, take care of your heating system during the summer months. As with any market, oil delivery is priced competitively among the companies that offer the service. While you might have found the best available deal with one local company last year, a better offer from a nearby competitor might present itself this year. Therefore, you should shop around each year to find the best current prices and delivery options on heating fuel. The easiest way to find the best local deals is often to do an internet search. This should bring up matches of the latest offers on fuel to homes in your area. In some cases, the provider that you are currently with will adjust to whatever competing offer you bring to their attention. Remember, most businesses would rather keep your business than see you go elsewhere. One of the easiest ways to avoid spending more on oil or propane is to stretch out your current fuel supply. If your house is properly insulated and your windows are free of drafts, you will likely need less heat than your poorly-insulated neighbors. Even then, you can still conserve fuel by dressing warmer in the winter months. To a lot of people, warm clothes are designed for the outdoors, but those thick sweaters, coats and scarves can also keep you comfy indoors. As Jimmy Carter once advised the nation while sitting beside the White House fireplace — turn down your heater and put on a sweater. Even when you do run the heater, warm clothes will remind you when to turn it off. If the heater runs for ten minutes and you start to feel sweaty under all those warm layers, that will be your cue. This way, you can save much more on fuel than the people who wear t-shirts indoors during subzero winter spells and forgetfully leave their heaters on for hours at a time. During the cold months of the year, there are many ways to avoid the unexpected costs that a lot of homeowners face just to keep their homes warm. The most important thing that you can do is prepare in advance of the wind, snow and freezing temperatures of winter. Pay attention to your fuel gauge and keep the level above the 1/4 line at all times. That way, you can avoid the extra fees associated with emergency delivery calls. Moreover, use each fuel delivery as an opportunity to fill your tank to the max. At Smart Touch Energy, we deliver heating fuel to homes in Connecticut, Delaware, Maine, Maryland, Massachusetts, New Hampshire, New Jersey, New York, Pennsylvania and Rhode Island. Our technicians provide heating oil and propane fuel. We also offer technical services on burners and A/C units. Check our prices and services or contact us today for more information.